Join us for a Labor Day bicycle adventure! We have two options depending on your commitment level and desire. One option is a more adventurous ride from Barre to Groton State Forest, the other a ride along the unpaved rail trails of from Plainfield to Groton State Forest. Join us for a Labor Day bicycle adventure! We have two options depending on your commitment level and desire. One option is a more adventurous ride from Barre to Groton State Forest, the other a ride along the unpaved rail trails of from Plainfield to Groton State Forest. Please read through this entire page before registering! At the bottom of the page you will find a registration link. There will be a pre-ride meeting August 28th at 6pm. If there are still spots available this will be the last chance to sign up. At the pre-ride meeting we will go over the supplies list, have a few tutorials about the challenges we might experience on the ride including a flat repair clinic. We'll update the calendar with more info. 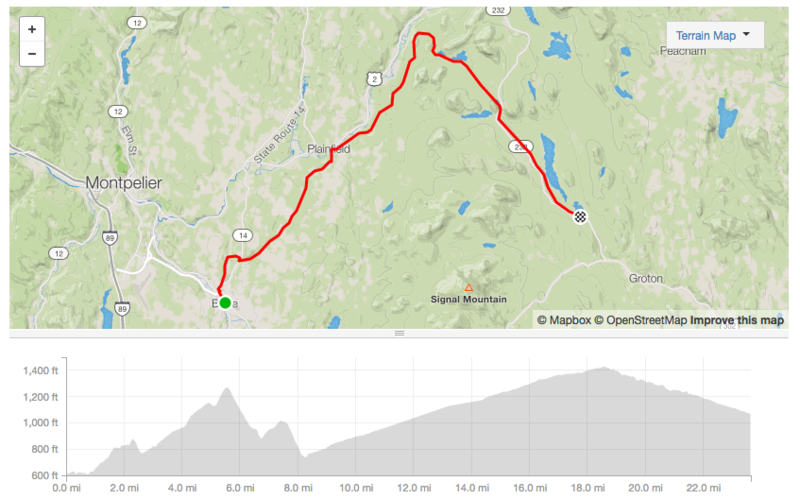 For the ride we’ll meet at Vermont Bicycle Shop Sunday, September 4th at 1:30 pm. We recommend folks come downtown early and check in at the shop around 1:00 or 1:30 and then venture out for lunch or a coffee and to pick up any last minute supplies. We will be splitting the ride into two groups. A longer adventurous route with riders starting in downtown Barre, this is the A group; a shorter route starting in Plainfield, this is the B group. We will leave the bicycle shop as close to the 2:00 PM closing time as possible. If this is the case we would expect to meet the B group at the Plainfield Park and Ride a little after 3:00 PM. We still ask anyone riding in the B group to check in at Vermont Bicycle Shop if possible between 1:00 and 1:30 in order to designate a contact person/leader for this group. We may be delayed assisting customers or for other reasons. This may end up delaying the A group departure to no later than 3:00 PM. In that case we will designate a contact person between the A and B Group and make sure to make contact when the A group leaves Barre. We will be splitting the ride in two groups. A longer and adventurous route, this is the A group, and a shorter route, this is the B group. We will ride out of Barre towards Plainfield via Farwell Street and Plainfield Brook Rd. 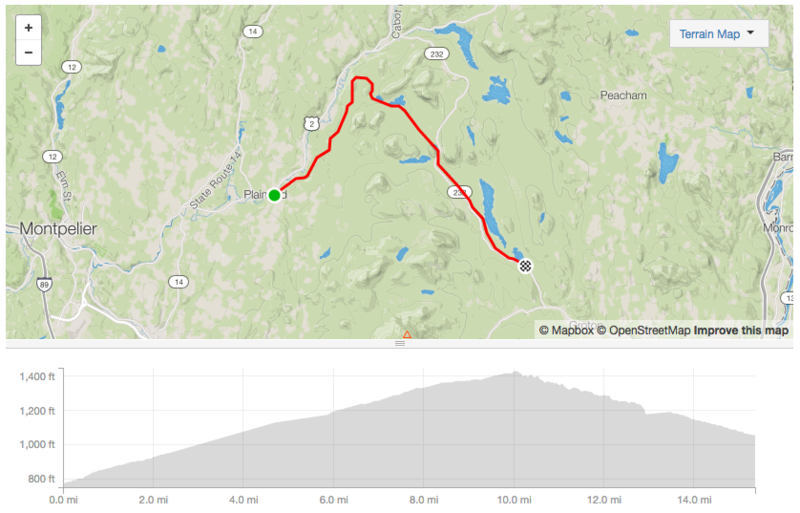 This is a mix of Gravel and Pavement with two climbs followed by a steep and fast descent to Plainfield. We will meet the B group as we pass through downtown Plainfield and gather at the Plainfield Park and Ride. For those who are opting to meet us in Plainfield and skip the check in at VT Bicycle Shop, we recommend gathering a little early at around 2:30 or so and heading downtown for some great food at Positive Pie Plainfield. As long as there are no delays both groups A and B will gather and then leave the Plainfield Park and Ride a little after 3:00 PM and take the rail trail out toward Groton State Forest. There are a couple of branches from the trail that the longer route riders (Group A) will take, each ride leader will have a working knowledge of the routes and we will typically re-group in spots along the ride. This year we will be staying on Ricker Mills Pond, the site is almost directly off the trail and for those who want a more remote camping experience there is some additional places to camp as well. We are expecting that everyone will roll into camp around 6:00 PM. We'll set up camp and cook dinner followed by some camp fire fart jokes. This year we also have the option of staying an extra day. We will be offering up a midday adventure ride to those who want to stay with us. The Monday to Tuesday stay in Groton State Forest is the one of the quietest camping experiences I've had. With most people going to bed early Sunday night and packing up Monday morning it's a great time to have the lakes almost to yourself. This will be a most not dropped ride, we will do our best to make sure we all stay together as a group, however, we ask that riders have the ability to make the trip from Barre to the campsite in roughly 3 hours or from Plainfield to the campsite in roughly 2 hours. If you are not certain about that speak with us, it is a very easy route from Plainfield to the campsite. It is also a moderately easy route with some climbing from Barre. The slowest average speed to make this ride is around 7 miles an hour. If you have ridden mixed use trails in the past with distances of 12 to 15 miles then you will have no problems riding the route from Plainfield (roughly 16 miles) to the campsite. The adventure route (roughly 24 miles) is a good option for those with experience in medium to longer mountain bike rides in Vermont. Riders are expected to be moderately experienced cyclists. An off road worthy touring, gravel road/cycle cross bike or mountain bike in good working order is required. We’ve also come up with a list of things to help you prepare. The list is in two sections, one for Bicycle Supplies, the other for Camping Supplies. Some things on this list are not necessary, some things are required. Familiarize yourself with the advice on the above website, this list, and bring things that are required and things you are comfortable carrying with you on a bike. OF NOTE: If your bicycle does not use quick release levers you will also need the appropriate tools to remove the wheels from your bicycle. You can ask Vermont Bicycle Shop about this if you are not sure. Cycling multi-tool or small, light weight tools to help fix your bike. Vermont Bicycle Shop will bring two card games, Exploding Kittens and Cards Against Humanity. Feel free to bring something equally fun! A Beginner's Hut-to-Hut Bike Packing Adventure in Maine!